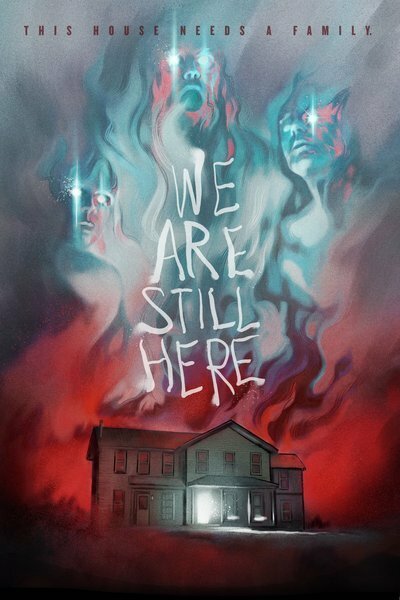 For its first half-hour, “We Are Still Here” might give the impression that it’s one of those new-fangled “subtle” independent horror movies. You know, the kind that depends more on “mood” and “atmosphere” than on Guignol scares and shocks to reach its viewers. All of which, or, okay, several of which, are just fine. I guess. But nuance has its limits. So I’m glad to report that the subtlety of this movie’s first third is in fact a sort of feint. Once the viewer finds him or herself comfortable with the idea that it’s going for mildly-spine-tingling rather than gut-punching and eyeball-violating, all holy hell breaks loose. Which in this case turns out to be a pretty hellishly good thing. The film is co-written and directed by first-time feature maker Ted Geoghegen. (Full disclosure: Mr. G. has a day job as a New-York-based movie publicist, and I’ve had friendly and rewarding exchanges with him in that context.) It opens in spare, sober style, with picturesque shots of snowy dales, quaint edifices, and finally a lightly-dusted country road with a car driving over the pavement. The cars occupants are Paul and Anne (Andrew Sensenig and Barbara Crampton, the latter of “Re-Animator” and “From Beyond” fame), a middle-aged couple clearly troubled by something. They’re mourning, it turns out, the loss of a son, and as they settle in to their new country home, a place they hope will bring healing, Paul is disturbed by Anne’s insistence that she feels their son’s presence in the new place. Disquiet follows disquiet: a buttoned-up but bluff local old-timer, played by Monte Markham, shows up uninvited and lavishes tales of the house’s grisly past to Paul and Anne. Beside themselves, Paul and Anne invite their eccentric pals Jacob and May (Larry Fessenden and Lisa Marie), latter-day hippies with an interest in the occult, to come check the situation. In the meantime, Markham’s gone back to town to confer with his neighbors on how best to deal with a wrinkle in a situation that the whole burg seems to have set up to make supernatural stooges out of Paul and Anne. Long story short: their son is present in the house. But so are a lot of other extremely unfriendly beings. It’s around this point, beginning maybe with a highly surprising heard-but-not-seen shotgun blast, that the movie starts getting good and nasty and very bloody. The presence of Barbara Crampton should have tipped me off right away: given the amount of spatter she’s been obliged to contend with in most of her most celebrated movie roles, it would make little sense to place her in a relatively bloodless horror movie. And the whole trope of bad things lurking behind the brick and around the vicinity of a basement’s boiler is a favorite of Lucio Fulci, the Italian horror director justly famed for his scenes of offal-spewing. The gore effects of “We Are Still Here” have some more, um, finesse than Fulci’s magnificently crude images, but that doesn’t make them any less effective. This is in part because Geoghegen is a master of both the suspenseful buildup and the just-when-you-think-the-bloodletting-is-over-here-comes-another-thrust-and-or-slash effect. The scares and the shocks work very well with the twists of the plot, which are within the boundaries of conventional genre fare but are pulled off with panache and some not-displeasing variation. Also exceptional is the use of a dirty white canvas contractor’s tarp hanging off a wall in the grand finale, which really puts the expected exploded organic matter that hits it into bold relief. More than a mere homage, “We Are Still Here” is the kind of movie you wish you could take back in time with you and project in your favorite 42nd Street grindhouse.